NIA-CHARLESTOWN NEVIS (December 28, 2011) — October to December have been months Police Agencies across the world usually experience spikes in robberies and burglaries and it was no different in St. Kitts and Nevis. That was a view expressed by Commissioner of the Royal St. Christopher and Nevis Police Force Mr. Celvin G. Walwyn, during a recent official visit to Nevis. 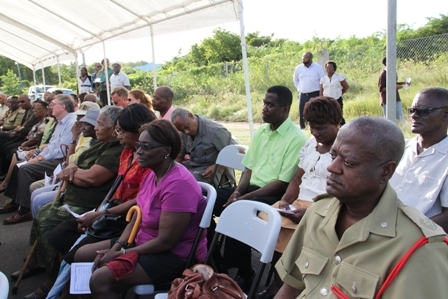 He was at the time delivering remarks in Nevis at the formal Dedication and opening Ceremony for the new Cotton Ground Police on December 22, 2011, a facility constructed by the Nevis Island Administration (NIA) in its effort to help stem crime on the island. However, Commissioner Walwyn said as a result of Police efforts, there had been a reduction in crime in St. Kitts and Nevis. “Crime has been reduced in the Federation. Homicides are down significantly and represent less than 2 percent of our crime report to date. “Our challenge has been in burglaries but with citizens taking steps to protect their property, that too will be reduced,” he said. According to the Commissioner, although the Police in Nevis had also taken steps to reduce robberies and burglaries on the island, the public should work with the Police and report any suspicious activity they saw. “All Divisions within the Nevis Division of the Police Force have been diligently working to reduce crime. The Nevis Task Force is truly a team approach to combating gang issues and problems in the Nevis area. “They have partnered with the delta Squad from St. Kitts and have increased their patrols and stop and searches in Nevis over the last three weeks,” he said. On a note of caution, Commissioner Walwyn explained that the Delta Squad was a no-nonsense team with zero tolerance and would not hesitate to arrest anyone who interfered with their operations without fear or favour. The Squad is made up of Police Officers and Defence Force Soldiers. 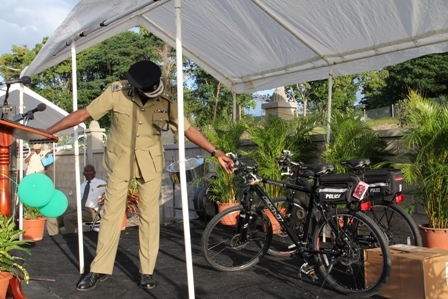 During his remarks, the Commissioner also presented two bicycles one for use by Police Officers of the Charlestown Police Station and the other for Officers of the Cotton Ground Police Station. He said the cycles would help with their patrol efforts and had to be driven by a uniformed Officer at all times.